The first in the 4c* natural hair series is AlexisBD. 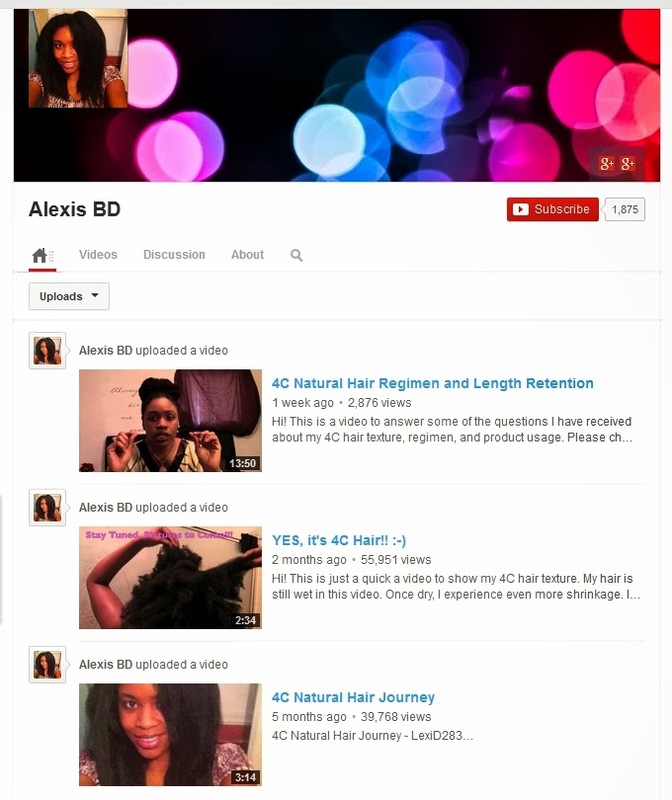 She is a relatively new youtuber with BSL possibly mid-back length 4c hair. I have picked her as the starter for this series because she has a video with her hair completely shrunken. The biggest identifier of 4c hair is that super shrinkage where no matter how long your is, when fully wet and left to its own devices, it just wants to hug your scalp. Therefore her BSL hair will easily shrink to neck length. 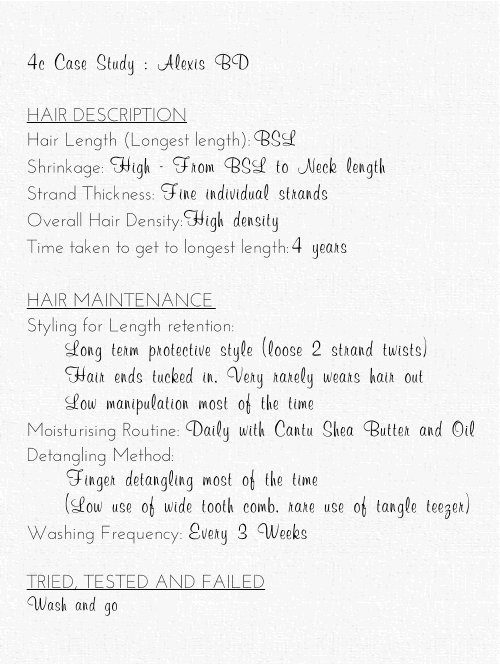 As this series is intended to be a case study of people who have long 4c hair and the methods they used to successfully achieve this length, I have also compiled the case notes for each featured person with clear information on the the key properties of their hair and key notes on how they handle and style their hair. *Disclaimer: Please note that hair typing is NOT a science, for the purpose of this series, the people featured are identified solely by me (Jc) as having 4c hair characterised by a tight curl and high shrinkage. Many people with 4c hair may identify their hair as 4a/4b if they are following the actual book reference for hair type which does not include 4c. 4c was created by natural hair forums to describe high shrinkage hair. Very interesting. Looking forward to the information gathered. I'm so glad you did this! Brilliant! It's great to have 4c ladies being featured. It will help with knowing what to do to also achieve length with that category of hair. Afrolicious, your comment has been deleted because it looked like spam. However, in the event that you were not putting spam and looking for tips on 4c hair, here is my advice, products will not help you, techniques will. Hi JC....Alexis has very beautiful hair!